Ball Buster is a very simple, yet challenging game. 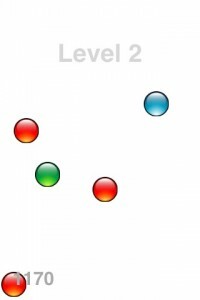 In this game you are a blue ball trying to stay away from the red balls. You control the blue ball by placing your finger on it and dragging it to the desired spot. Each time you stay alive long enough to earn a thousand more points, you move onto the next level. The completion of each level adds one more red ball. All of the red balls move at a different speed making the game play more difficult. To help you with evading the red balls, there are green balls which are power ups. The power-ups include: invincibility, destroy, freeze, small, and big. Invincibility makes the blue ball invincible. No red balls will affect you while using this power-up. With destroy, any red ball you hit will be destroyed. When you destroy the red balls, only some of them come back. You also get bonus points for destroying the red balls. Freeze keeps the red balls locked in place while you have the ability to move around freely. But watch out, if you hit a red ball while it is frozen, you will still die. Big and small change the size of the blue ball. These power-ups only last for a limited time. When you die, you have to start over back at level one. The longer you stay alive, the more points you receive. You can save your high scores and challenge your friends with your high score via email. One suggestion for this game is to add the option to use the accelerometer to control the blue ball. Ball Buster is a great game with lots of potential. It will entertain you and your friends for hours on end.